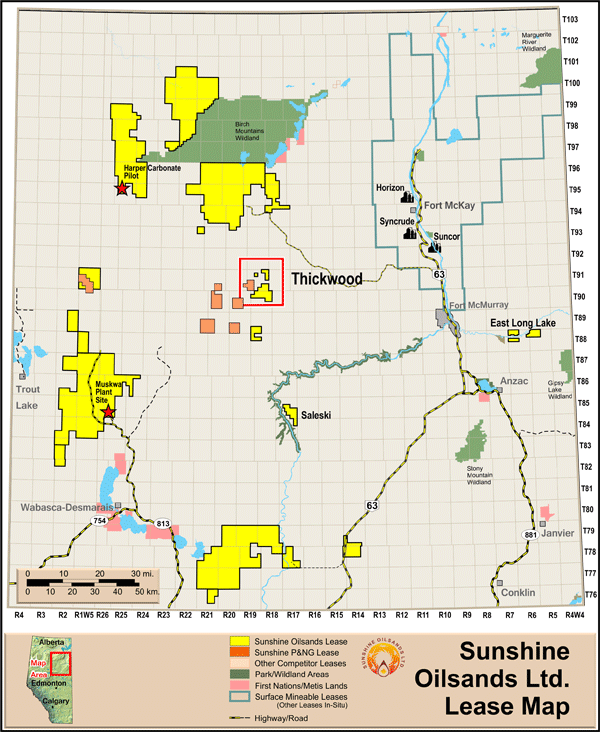 Sunshine's Thickwood location received regulatory approval for a 10,000-bbl/day commercial SAGD facility Sept. 15, 2013. This asset represents the 70,000 bbl/d production forecast development plan. With full regulatory approval of the Thickwood SAGD project received Sept. 15, 2013, Sunshine is advancing front end engineering design (FEED) activities. 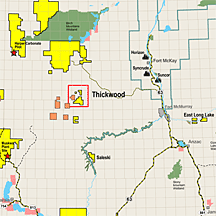 The Thickwood region consists of Oil Sands Leases covering 5,888 contiguous gross and net hectares and is located within the Athabasca oil sands region between townships 90 and 91 and range 18 west of the fourth meridian, approximately 90 km from Fort McMurray and 40 km from West Ells. On the basis of Sunshine's assumptions, we anticipate that Thickwood will be capable of producing greater than 70,000 bbl/d of bitumen and is expected to maintain a productive life of 47 years. The Thickwood area will also be developed in phases in order to control costs, implement improvements in recovery technologies and improve efficiency. The Thickwood asset team has completed the DBM (design base memorandum) and is structuring agreements for long lead equipment and services.